How big of a problem is gentrification? How much affordable housing does the city need at what percentage of area median income to prevent displacement? On November 13, we'll take a look at these questions and more at our final panel as part of our Equitable Development series. We'll also be hosting an IDEA Lab in early 2019, that will explore urgent topics to help inform and educate how Detroit can grow inclusively. The panel is moderated by Stephen Henderson, host of WDET's Detroit Today, with panelists including Phyllis Edwards, Executive Director of Bridging Communities, Inc., Raquel Garcia Anderson, Director of Partnerships and Community Outreach for Global Detroit, and Detroit’s Chief of Services and Infrastructure Arthur Jemison. 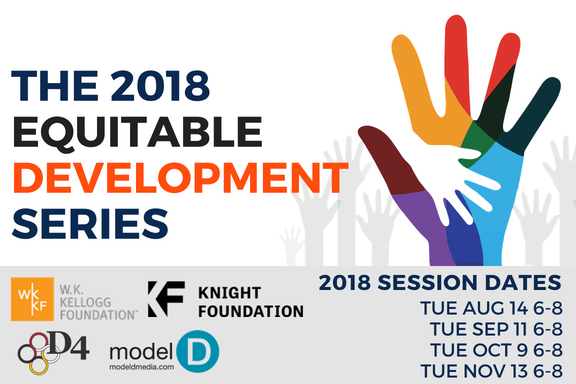 This event is part of our Equitable Development series, in partnership with Doing Development Differently in Metro Detroit, where we explore issues and stories on growing Detroit in a way that allows people from all races, classes, and abilities to participate and benefit from development. Read more articles in the series here: https://bit.ly/2NS3gM2. The Equitable Development Series is made possible thanks to generous support from the W.K. Kellogg Foundation and the Knight Foundation Fund of the Community Foundation. Issue Media Group is a parent company of online publications across the US including Metromode, Model D, and Concentrate here locally in the Metro Detroit region.